As we enter Holy Week, after a season of loss, I realize that there are lessons from the Camino which are helping me walk the journey to the cross, with others, with Christ. So many of us are encumbered with things that hold us back, hold us down. We want to move easily, with comfort, and in peace. We know that we can save our backs and feet - and especially stay focused - when we don't have luggage that weighs us down. And yet, we are our own worst enemies. We overpack in our lives. On the Camino de Santiago, this is most often because we want to bring everything in our backpacks. This instinct is almost always grounded in one thing: fear. Fear of not having something we feel is necessary. Fear of hunger, of danger, of darkness. And yet, a most important saying along the Camino is "The Camino Provides". Most travelers don't realize that there are food options everywhere you go. That we find pharmacies in every village. That we can find people who will share their water with us. The Camino DOES provide... so long as we accept its generosity and the love. We have to forget about the uncertainty of fear in order to gain the certainty of love. Our packs like our lives are overloaded and, within a few days, you start seeing people leave things behind in the albergues. We have to release the materials items, these stones, that weigh us down and say goodbye to them. We let go so that we can flourish on our walks. But it's not just about releasing a physical stone. It's also about letting go of the emotional stones that hold us down. Unlike the fear that drives us to overpack, the emotion that we can't unpack and leave behind is anger. 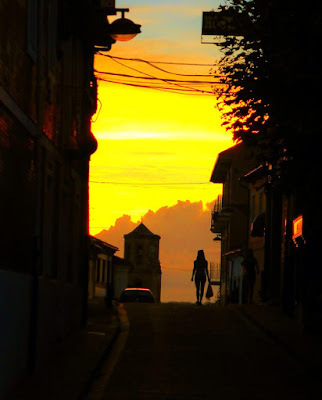 People on the camino, myself included, get frustrated by crowded cafes, by bicyclists who don't warn you of their approach, of cars that don't see you. In our exhaustion, we get angry that we have to change plans because there's no room at the albergue, or because blisters appear, or people smoke or talk too loudly, or take selfies, or drink too much. The litany of gripes can seem endless. We may not have packed that anger in with us, but it's coming along for the walk. And we can't seem to let it go. So we have to treat our frustration and anger like stones. We have to recognize the weight that they bring to our journey and trust that it's possible to release it. We must set the stone down. We can't walk with Christ, in love, with open eyes, when our hearts are filled with granite. We may travel the Camino alone, or we may travel with friends. But around us at all times are strangers. People from other lands, speaking other languages, with different diets and customs. They're like you and me. And they're not. They are like the Samaritans. Yes, go back far enough, and we're related, but today we're different. And they might be overpacked, with stones, with the same troubles as ourselves. It's easy to walk past them and not realize what's going on in their lives. But my greatest memories along the Camino are when I didn't walk past the "other", but instead invited them into my space, my life, my journey. By sharing the pilgrimage of life together, we create a larger life, a larger sense of self, and a discovery of shared values. Often times, it's that moment when we realize that we're overpacked that we also realize that we need the stranger to help us out. Together, you can pool information, resources, food, laughs, memories. The things we yearn to find on the Camino are unknown to us. They await to be learned and discovered, but for now those insights are strangers. And, we can't embrace the insights of the Camino if we can't embrace the stranger. I hope that your journey through Lent brought you ever closer to Christ, to Easter, and the hope you seek to find and celebrate. And now, as we near the end of this 40 day walk, may your Holy Week remind you of the need to travel lightly, to set down your stones, and to embrace the stranger. May your Holy Week be anointed with grace.